The Department of Industrial Policy & Promotion (DIPP), Government of India, has released an extrodinary notification that is soon to be published in The Gazette of India about the constitution of an India Design Council (IDC) in pursuance of the National Design Policy announced by the Government of India on 8th February 2007. This particular Central Government notification is dated 2 March 2009. Image01: Composite image of two models created by design students at NID while exploring the concept of sustainability across two key areas of design opportunity as part of the Design Concepts and Concerns course at the Institute. The two areas represented here are “Roti” – Food and “Rojgaar” – Occupations, both critical needs of our people that are to be served by design action and imagination. We hope that the agenda of the newly constituted Indian Design Council will eventually expand to include and then address these critical development issues along with the list of major activities listed in the notification reported below. We also hope that the members of this Council will bring greater awareness to these critical design issues and improve the use of design by the various sectors of our economy, particularly in the development sectors where it is needed as a critical input and not just promote the use of design as a handmaiden for organized industry to generate profits and contribute inadvertently to global warming. Perhaps as we go forward we can hope to see a greater representation from the design profession and design academia in India on this Council as well as a vigorous participation of democratic representatives of numerous Associations of Design Professionals from various fields which is glaring by their absence from such a Council. Indian design professionals and academics need to get their act together and work towards contributing to the initiatives taken by the Government through the Design Policy initiatives. According to the notification this Council would have a tenure of three years besides other rules as notified for its routine functioning. • undertake design awareness and effectiveness programmes both within India and abroad. • act as a platform for interaction with all stakeholders. • undertake R&D and strategy and impact studies. • develop and standardize design syllabi, etc. for all institutions in India imparting education. • conduct programmes for continuous evaluation and development of new design strategies. • develop and implement quality systems through designs for enhancing country’s international competitiveness. • assist industries and design–led exports of Indian products and services including outsourcing its design capabilities by other countries. • take effective steps towards “cradle to grave environment-friendly approach” for designs produced in India so that they have global acceptance as ‘sustainable designs’. • enable Indian designers in India to have access to global trends and market intelligence and technology for product development and innovation. • encourage and facilitate a culture for creating and protecting intellectual property in the area of designs. This notification is issued by N. N. Prasad, Joint Secretary, DIPP, Ministry of Commerce and Industry. Bamboo & Cane Development Institute, Agartala (BCDI): CD ROM as a live documentation of intentions and actions of the design team from NID, Ahmedabad in partnership with the team from BCDI, Agartala. – “Beyond Grassroots: Bamboo as Seedlings of Wealth”. 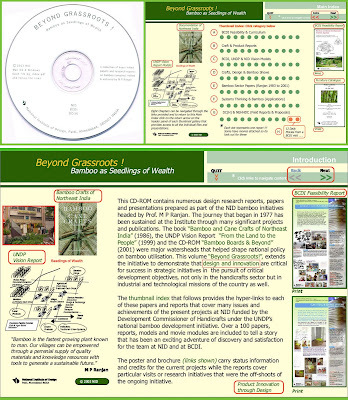 This CD ROM was produced in 2003 - 2004 using reports, movies and pictures that were part of the very detailed visual documentation that was maintained by the NID and BCDI teams using digital tools that were constantly available as a project policy. The intention was to build an Institute that could address the very complex needs of the “Grassroots sector” in rural India through the creation of human resources, knowledge resources as well as market linkages with the use of a potential local material such as bamboo which could be used to support a whole spectrum of development activities that could lead to positive change in the lives of the people. This CD ROM is available for download from this link here as a 560 mb zip file that unpacks into hyper linked folders and files all connected through a series of navigation screens shown below. We believe that India needs many institutes like this one if we are to transform our rural economy with the use of local resources in a sustainable manner and in a politically stable eco-system that can survive well into the future with the use of design, decentralized local governance and local entrepreneurship. 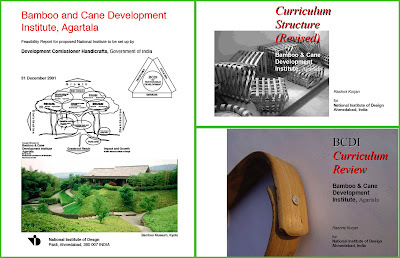 Image 00: Feasibility Report for the setting up of the Bamboo & Cane Development Institute on the left and the two stages of BCDI Curriculum Development are on the right. Image 01: This CD ROM opens with an introduction, which provides an overview of the resources as well as the intentions of the design team at NID. Image 02: The Introduction screen, the Main Index screen, and two of the seven sub-index screens are shown here. 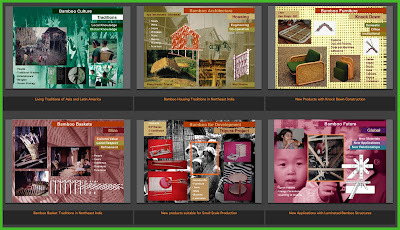 The seven sub-index sections lead to a variety of resources that were either created as part of this project or were used as background resources to inform the thoughts and actions on this very interesting design initiative in institution building for the growth of the bamboo sector with the specific objective of addressing poverty and development needs of the rural sector with the use of design and local crafts skills. The Development Commissioner of Handicrafts Government of India supported this project through the funds available from UNDP as part of the National Bamboo Mission initiatives at the turn of the century. The support for the project continued till mid 2004 and the work done during the project phase is documented in the CD ROM mentioned above. Image 03: Four sub-index screens dealing with Craft and Product development reports, Design and Bamboo shows, Systems Thinking project reports and the index for movies that documented 12 days at BCDI in May 2002. The Craft and Product development reports were created as part of the ongoing product design explorations in bamboo and craftsmanship that involved NID faculty, students as well as BCDI faculty, students and craftsmen. Each project had individual goals and focused on one type of product be it furniture or domestic and office accessories that could be crafted in bamboo. 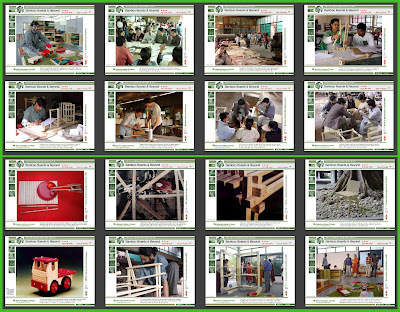 Besides these reports we have also included Systems Thinking course outcomes for the NID Furniture Design programme where several batches of students were assigned individual projects in the area of bamboo and rural development initiatives with the use of this local resource. These explorations and the prototypes created are discussed in these reports included in this section. All these visits to BCDI were extensively documented using digital images. On one such visit to the BCDI the author made 12 mini movies using these digital still pictures and these movies are included in this section of the CD ROM. Image 04: View of the Bamboo Boards & Beyond exhibit on the UNDP lawn in 2001 and a note about the CD ROM about that project shown alongside the crafts and bamboo shows available in the Beyond Grassroots CD ROM. 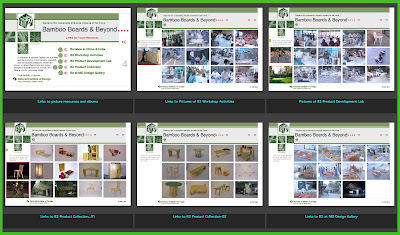 The Bamboo Boards and Beyond was a major project that preceded the BCDI initiative and has been discussed on this blog earlier. This image of the final exhibit at the UNDP lawns in New Delhi was not included in the previous CD ROM but it is included in this offering as shown above. This project helped open minds in Delhi and several National initiatives sprang from this particular event, which makes it significant for design for India. Image 05: CD ROM face graphics and view of CD Jacket for the Beyond Grassroots, a joint CD publication from NID and BCDI. While the CD ROM is available from the links on this page the CD Jacket can be downloaded as an A4 size printable artwork from this link here as a pdf file of 1 mb size. The BCDI Feasibility report was redesigned for print in a compact A5 format and the artwork can be downloaded from this link as a pdf file 368 kb size. Interactive CD ROM authored in linked PDF modules with Quicktime movies and pictures of a product design and development initiative at the National Institute of Design in 2000-01. Download 550 MB zip file here. “Bamboo Boards & Beyond” : Bamboo, the sustainable, eco-friendly industrial material of the future. Image 00: CD ROM Graphics and first interface screen with six major sections that include Inroduction, Index of Papers, Presentations, Pictures and Sketches, a section about NID including the Eames Report and a interactive walk-through NID building in QiickTime VR. 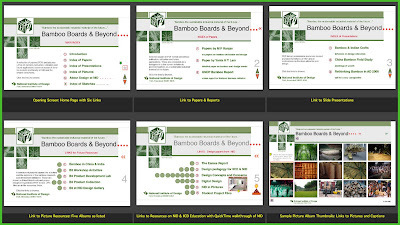 In November 1998 through February 2001 the United Nations Development Programme (UNDP) and the Asian and Pacific Centre for Transfer of Technology (APCTT), New Delhi, had supported field research on laminated bamboo, a concept development workshop on the creation of new applications with laminated bamboo boards through a research and development initiative by India’s premier design Institute, the National Institute of Design. This workshop aimed to position bamboo as a sustainable eco-friendly industrial material of the future. The workshop at the NID campus involved professional designers and architects working with students from NID and other design, technical and architectural schools. They created numerous design concepts using the new material, bamboo boards, currently being sourced from China and India. A product development lab at NID created refined prototypes that are on display. Image 01: Interface screens from the interactive CD ROM showing the arriving screens at the index level that each lead to the specific resources listed therein. 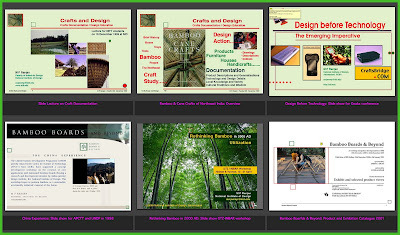 These include numerous papers on bamboo and design, 300 pictures from an album of selected pictures with captions from the workshop and its resources and outcomes. This exploration and product development workshop was preceded by a number of field visits conducted by Prof M P Ranjan and his team in the field in India and China that started as part of a consulting project at NID for the UNDP in India. These visits produced a number of reports and the insights that were gleaned from these studies went on to inform the further developments in the National Bamboo Mission initiatives that followed with financial support from the UNDP to the Government of India. Image 02: Thumbnail images that are links to particular sections of images as listed in the Image Index. This CD-ROM provides background information on the emerging status of bamboo through papers and pictures from ongoing research at NID. The complete CD ROM was reproduced and distributed in over 4000 copies as a free service from the Centre over the past six years and it is now available for free download here as a single zip file that is 580 MB in size that unzips into a folder which contains all the necessary files and hyper links to afford interactive viewing from the individual desktop for offline viewing. The files are in hyperlinked pdf and Quicktime format for easy viewing across platforms on Windows Mac or Linux computers using free software available on the web. 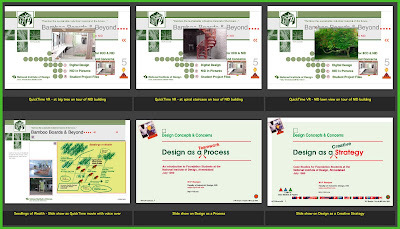 Image 03: Sample screens from the major presentation slide shows that are included in the CD ROM as pdf files that can be seen in an interactive manner. The little Red square goes to the next page while the little Green square takes one back to the main index above. Faculty & students from leading design schools in India and Finland, architects and professional designers from all over India as well as experts from technical and development institutes dealing with forest products and engineering applications in wood and related materials. 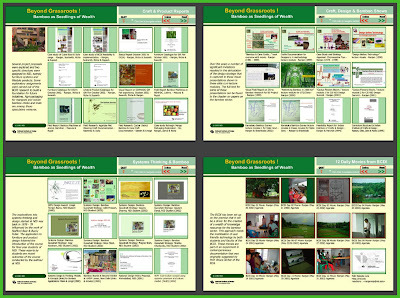 Image 04: Sample pages from one multipage presentation offered in pdf format shown as thumbnail images. 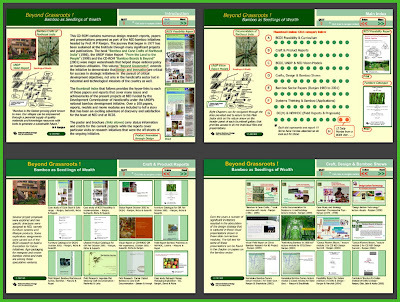 This CD ROM was authored in PDF format so that they would be easily available for students and researchers interested in bamboo applications and design even if they are located in remote areas away from web access. Image 05: The QuickTime VR presentation shown as popup windows in the upper row and other prresentations as thumbnails in the lower row. The numerous QuickTime movies available on this CD ROM run within the pdf files to which they are connected in order to supplement the content that is being discussed in each file or visual presentation. The QuickTime VR provides a walkthrough of the NID campus as it was organized in 2000 and much has changed on campus since then but the walkthrough will be a nostalgic reminder of the old NID for our students and faculty who have known NID in the Ninties and earlier. The elaborate wood and metal workshops that were planned by international consultants when the NID was founded can be seen in this walkthrough. Image 06: Thumbnail images of photo album that contains 300 selected images from the workshop and from the background research that led up to the workshop at NID. The research and the workshops generated a lot of creative energy from all the participants and this digital picture gallery captures this energy to show the flow of design action when exploring and developing applications using a new material such as bamboo boards for exciting future applications. Image 07: Graphics for the set of three CD ROMs that were released by the Centre for Bamboo Initiatives at NID in 2001, 2003 and 2004 respectively. The first CD ROM is available for download as a 550 MB zip file from this link below. The other CD ROMS will be made available at a future post on this blog in a week or two from now. Image 01: Stephen Huyler posing in the NID Library with five of his books, all well used by students and faculty, from the NID archives. An impromptu display of books was created in the NID library to let the students know that the author of the five books on Indian art and culture was also speaking at the NID Auditorium on the evening of 4 March 2009. 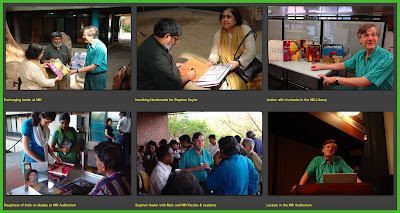 The occasion was the promotion of his new book “Daughters of India” across India and the stop at NID was one of many pit stops across many cities in India at the invitation of the publisher, Mapin Publishing, Ahmedabad. I had met Stephen Huyler first in 1986 at a conference on Design of Crafts Museums at New Delhi, which was organized by the Crafts Council of India in October 1986. It was during this very conference that my book “Bamboo and Cane Crafts of Northeast India” was formally released at a simple function at the National Crafts Museum at Pragati Maidan and Stephen Huyler and all the other speakers of the conference were present at the release function where Shri P A Sangma, MP from Meghalaya was to chief guest. Stephen Huyler’s then new book had been released a year earlier and “Village India” (1985) still remains the only significant study on rural arts and crafts and lifestyles that cover the whole sub-continent between the covers of one richly illustrated book. This was followed up “Painted Prayers: Women’s Art in Village India” (1994), “Gift of Earth: Terracotas and Clay Sculptures of India” (1996), “Meeting Gods: Elements of Hindu Devotion” (1999) and now with his inspired offering, “Daughters of India: Art and Identity” (2008). Image 02: Stephen Huyler featured in a series of events at NID. Exchange of books “Handmade in India” for “Daughters of India” between the Editors and the Author at the Gautam-Gira Square under the Big Tree at NID, followed by a visit to the NID Library and then onto the NID Auditorium for the book sale and talk by the Author. Aditi and I got a signed copy of Stephen Huylers book for the man himself and we in turn gifted him an inscribed copy of Handmade in India in the presence of a small entourage of NID Faculty and Bipin Shah the Publisher from Mapin Publishing. A small audience had assembled to hear the talk, which was as usual a rich presentation of images and an impassioned sharing of experiences with the selected women of India who had been featured in his book. The stories were touching as well as inspiring. I introduced Stephen Huyler to the NID audience and spoke about his passion for travel and his long and winding journeys through India that started in 1971 and continues today, and each year he has been in India for three or four months each year, all the time with his camera and recording his experiences of living with the people wherever he went. 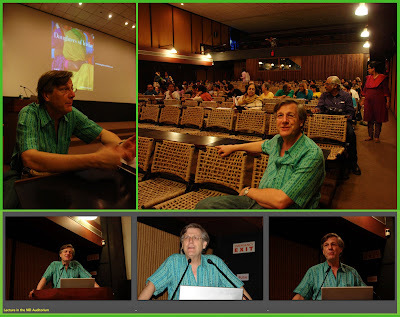 Image 03: Stephen Huyler at NID Auditorium on 4 March 2009 for his talk about his book “Daughters of India: Art and Identity”. 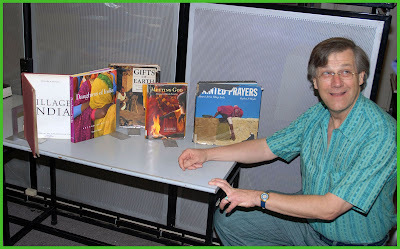 Stephen Huyler spoke at length about the book “Daughters of India: Art and Identities” and he illustrated his talk with images and stories of a few of the women featured in his book. The book profiles the lives and art of 20 women he had carefully chosen from a vast range of experiences so as to cover many facets of India across many regions and class barriers while he looked at women and their roles in the Indian sub-continent. Here at NID he chose to speak about Pushpa, who works as a sweeper at Mumbai Airport and lives in the slums next door, and this reminded all of us of the Oscar winning film “Slumdog Millionare” that has caught the attention of the West like none other before it. He also spoke of Indira from Jaisalmeer, Kusima from Badami in Karnataka, Sambai from Ludia in Kachchh in Gujarat and finally about Sonabai from Sarguja District in Chhattisgarh, all touching tales and full of appreciation of both their art and their character that was shaped by the many difficult experiences that they had related to him on his journeys across India. Bibliographic Data: and link on Amazon and the publishers in the USA, The Abbervile Press and in India, Mapin Publishers Pvt Ltd.